Smartphones, outlook calendars and… heaven forbid… Siri, can all keep track of our daily schedules. Nevertheless, you’ll still see paper diaries and wall calendars lining all the best offices throughout the region. But why, in the age of smartphones and digital planners, should I have a paper version? A paper diary is so much easier to use in stressful situations. 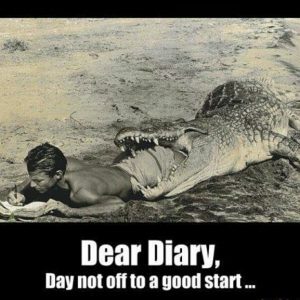 We would however suggest you never smile at a crocodile. We all live and think differently. Pen and paper provide you with the freedom to create a system that works for you. Write down only the details you need to know, and don’t bother even thinking about the extra information that you already have in your head — you get your car fixed at the same shop every time, why are you still entering in the location? A pen is also less likely to bog you down with the act of actually creating the reminder. Scribbling Meetup @ 2:30PM takes much less mental energy than opening an app and filling out the many variables that come after tapping the “add” button (seriously, why does creating a meeting involve as many entry fields as a filling in a passport application!?). Physical calendars don’t come with notification bars where some alert calls for your eyeballs, nor do they make noise (unless you drop them). They don’t put a strain on your eyes, they don’t run out of battery life, and they don’t come out with an upgrade every few months. Nor do they require creating an account and giving a company access to your daily schedule. The act of picking up a pen can get your mind thinking differently from the way it does when you place your fingers on a keyboard. X-ing out previous days may help you better keep track of the date. Physically turning pages may force you to think about how time’s always moving and motivate you to make better plans in the first place. Yes… sometimes just holding something in your hands can make all the difference. We’ve put together a great range of 2018 diaries, planners and wall calendars to help you get (and stay) organised. Just visit http://bit.ly/2v3A0s0 and grab a bargain.